We took a little trip to Boulder yesterday, so Abe could meet the ladies I used to work with before his first tooth comes in. I always forget how much I love Boulder until I'm on my way there. 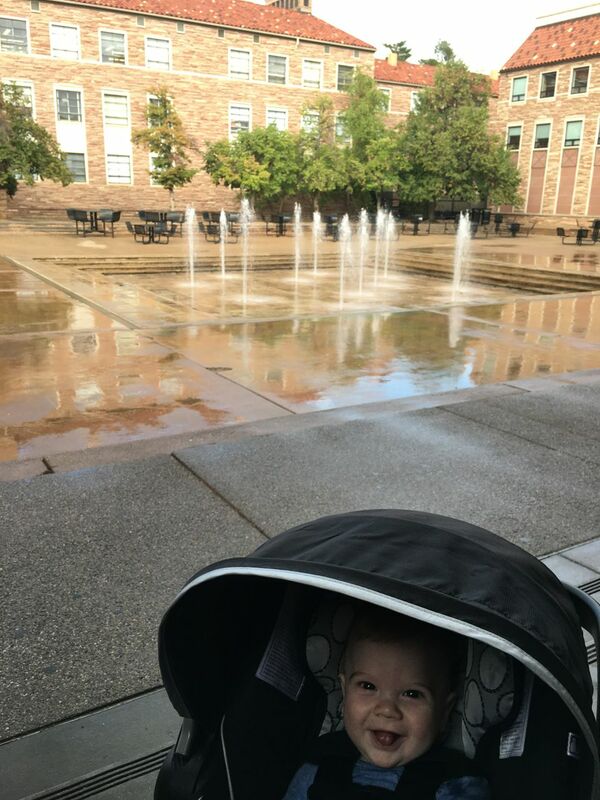 It's hard to believe it's been more than ten years since I finished college, but it was pretty apparent yesterday as we bopped around the campus with his stroller (and sort of accidentally wound up having lunch in a dining hall - oops). It was so much fun to walk around with my little buddy and tell him things like "This is where your mama once slipped on some ice and fell flat on her back with her backpack on. And because her backpack was so heavy, she couldn't get up without extracting her arms and rolling over first. It was pretty embarrassing." Have I ever told you that story? Well there you go. We had to make a stop at the campus book store because, as I sadly did not realize until the day of the annual CU vs CSU game, Abe didn't have any CU gear! We remedied that situation yesterday. And now homeboy's going to be wearing CU onesies every day until he outgrows them because those suckers were not cheap, let me tell you. Abe was pooped, but not too pooped to party. He ate his oatmeal and green beans and squealed with delight the whole time we were there. I promised him we'd take him back once he's big enough to eat pork belly. It was way past his bedtime when we got home, but I'm pretty sure he had a good time.